Planning and preparation for the ING New York City Marathon begins months in advance of race date. Despite New York Road Runners thoroughness in taking as many precautions as possible, it can't always prevent the unexpected from happening. The freak snow storm that hit the East Coast caused massive damage in many areas leaving some without power. 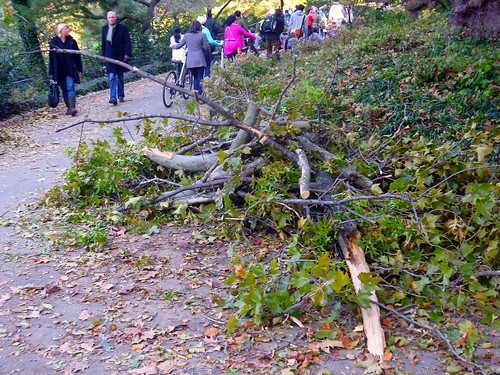 Central Park, where the marathon route finishes, was one of the places struck by the storm leaving fallen tree limbs and weakened branches. 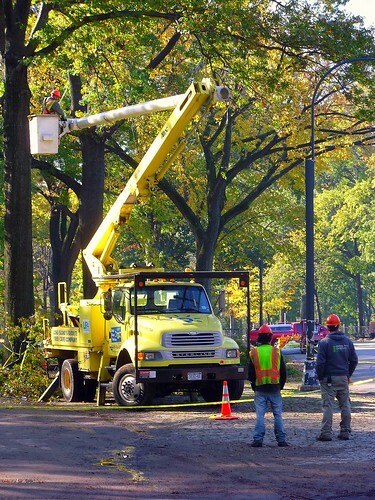 Clean up of the park began immediately following the storm, according to Peter Shields of Davey Tree Expert Company based in Canada. Shields said that five similar companies were contracted from out of state to aid in the efforts to clear the park in time for Sunday's marathon; however, the ongoing clean up is not solely for the marathon. Shields said, "More than 40,000 people will be going through the park next weekend, and even more when foot traffic now and following the marathon is included." He described it as a joint effort, with the primary goal being to make the park safe for people. "The public is attracted to hazards, and they don't fully appreciate the efforts and dangers the workers go through. 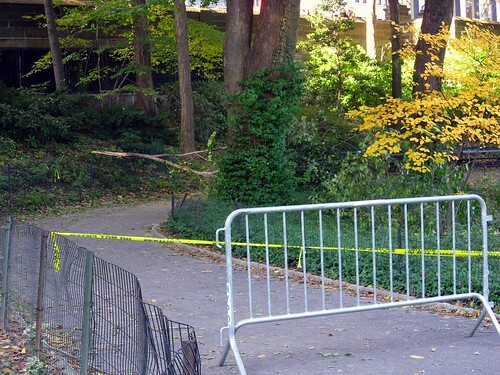 They see the yellow tape, and instead of staying out they go under it to investigate." As he said this, he pointed out a group of small children who had gone under the tape to look at a tree. Safety is one subject he strongly stresses when he teaches arboriculture in schools. He urges, "When you see men wearing hard hats and yellow tape marking off areas, please maintain a safe distance, so we can do our jobs without worry of hurting the public." The primary focus is to clear fallen and weakened trees and limbs that are considered an immediate hazard such as those obstructing major roads throughout the park. Shields and his crew were working along the marathon route when I spoke with him. His job is to check the area and log the damaged trees into an electronic database. "All the trees in Central Park are logged. I don't believe any other park keeps records to this extent, " he explained. Shields and crew follow along the storm's path entering data for the damaged trees into the log while another crew comes along from behind to take care of them. Clean up begins daily at sunrise and goes late into the day to get as much done as possible. "I was originally supposed to stay until Friday, but the job might be extended for two weeks total," he said. Shields, like many of the out of towners brought in to assist with the clean up, misses home, but he's making the most of it. "I've never been to Central Park before, so being here and working amongst the trees has been incredible. I love my job!" He describes himself as a tree geek, but who wouldn't be after walking around this iconic park? 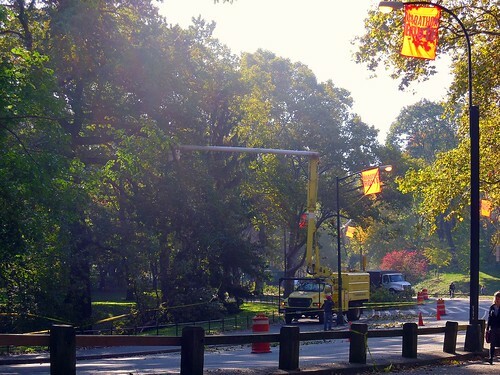 I was honored to be able to talk to one of the many sent to care for Central Park and get an insider's perspective on the extent of the clean up. We don't always know the strides being taken behind the scenes for such a large event, and our personal perspective is often skewered by our own opinion. The next time you walk by a clean-up crew in the park, realize how much effort the individual workers are giving to clear out the damage as quickly as possible. At the end of our conversation, I was able to explain to Shields about the objective of New York Road Runners this year and our goal to help make running in general, and the marathon in particular, more approachable to non-runners. When he asked how it can be made more relatable, I explained that the determination, dedication, planning and focus of many runners are traits that can be applied to other areas of life and not just marathon training . The ING New York City Marathon isn't just a long, group run in a big city. Rather, it's representative of the culmination of months of training for a purpose: the purpose of racing in honor of a loved one, the purpose of pushing oneself to complete a goal dependent solely upon one's own efforts, and, for many, the purpose of simply achieving a personal sense of accomplishment. Peter Shields agreed that while the ability to push oneself, as runners do every day they lace up their shoes, is important to apply to all areas of life, it is most keenly so in one's work life. "You need to push yourself to become what you want. I pushed myself to become one of the 13 arborists in Canada with my credentials, something only two percent of all arborists obtain." While he may be an ISA Board Certified Master Arborist, he keeps pretty quiet about it telling me that even the crew with whom he works is unaware of his title. In fact, it was deep into our conversation before Peter began to talk about it at all. Humility plus excellence. Sounds like a runner to me. What we all can take away from runners is that having the push, or the drive, keeps you focused on your goal when outside factors seem to knock you down. Everyone can apply this principle in some aspect of life, be it job, family or self, the latter being the simple, personal satisfaction of a job done to the best of one's ability. That looks like an amazing cleanup effort. Good grief! Excellent post, and a great message. Very nice! Although a late comment thanks for reminding me, great story Christina. Running like that truly is relating everything back to each persons personal attemps at acheiving their own goals. Congrats to all those who ran. Great park, Great people...I think they should bring back those old "I Love New York" slogans and commercials. It was great there. All the best and great writing.